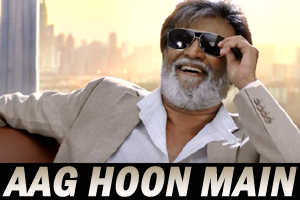 A playful song sung by Suraj Jagan and Arunraja Kamaraj featuring Rajinikanth. The video of this song is available on YouTube at the official channel Think Music India. This video is of 3 minutes 36 seconds duration. Lyrics of "Aag Hoon Main"
Lyrics in Hindi (Unicode) of "आग हूँ मैं"